Grubsheet is in mourning – along with much of the Australian media and wider community – after the death of ABC journalist Paul Lockyer and two of his colleagues in a fiery helicopter crash in the South Australian outback. It’s become a cliche to say that someone died doing what he loved. But that is the absolute truth in this instance and the sole comfort to be derived from a tragedy that has felled a much-loved national figure in his prime. Paul – along with his cameraman, John Bean, and pilot, Gary Ticehurst – came down on the shores of Lake Eyre – whose breathtaking transformation from dust bowl to watery expanse teeming with life they’d lovingly brought to national attention in two ABC documentaries and a host of stories on news and current affairs programs. Paul had literally fallen in love with Lake Eyre. So there’s also comfort to be derived from the fact that, in a sense, he died in his lover’s arms, no longer just telling the story of the never ending cycle of life and death in the Australian bush but becoming a part of it himself. Paul wasn’t only a former colleague and mate but one of the few true gentlemen of the Australian media – universally respected for his genuine affability and empathy for ordinary people, especially those carving out lives in the remotest parts of Australia. Much as he cared little for status, Paul had become the doyen of Australian rural reporters, instantly recognisable as “that nice bloke from the ABC” wherever he went. He was unfailingly respectful, never pushy and with a ready chuckle, sometimes tinged with incredulity at the more bizarre expressions of the human condition he’d encountered over four decades in the media. Why was he so popular in the bush? It wasn’t just his “open book” manner and instant capacity to engage. As a story-teller, he believed in simplicity. His was the no-frills style of narrative, a perfect compliment to the famed directness of your average Aussie and the national passion for a good yarn, told well. In Grubsheet’s opinion, there are two stellar exponents of the genre in Australian television. One is the laconic and poetry-spruiking Tasmanian, Charles Wooley. The other was Paul Lockyer. We last saw “Lockers” just over a week ago at the opening in Sydney of the latest exhibition of the works of Australia’s greatest living artist, John Olsen. As it happens, those works are also of the post-drought transformation of Lake Eyre – the reds, ochres and yellows, Olsen’s trademark colours, giving way to swathes of green and blue and yielding the birds, fish and other signs of life the rains had brought. Paul had never met John Olsen and the old man had been too weak after a recent operation to turn up himself. But he’d done Paul the singular honour of asking him to open the exhibition because of their shared love of The Lake. John’s son, Tim, read out a message from his distinguished father that was so effusive of Paul’s work on Lake Eyre for the ABC that Paul’s wife, Maria, and I glanced at each other in stunned delight and then glanced at Paul, who with characteristic modesty had turned a slight shade of pink. Here was Australia’s most famous artist saying Paul had been his inspiration and describing him as a great Australian who’d done the country a singular service by conveying the beauty and wonder of what Olsen called a once in a lifetime event. Paul then spoke of his own love of Lake Eyre, urging those present to do everything they could to get there before the miracle of nature subsided. 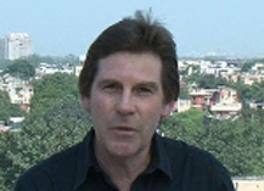 And in words that have a particular poignancy today, he expressed gratitude to the ABC for allowing him unfettered use of its helicopter to be able to tell the story of The Lake, along with the other rural and regional tales that had become both the hallmark and highpoint of his own career. Paul’s friends and colleagues used to joke that the ABC chopper had become “Locker’s ute”. Cruel is the twist of fate that has made it his coffin. Paul bounded back from the lectern shaking his head in wonderment at John’s Olsen’s glowing endorsement. But there was another pleasant surprise in store when Tim produced a gift from his father – an Olsen painting for Paul to put on his wall. The works on paper on the walls around us had price tags of $120-thousand so this was more than a gesture. Grubsheet remembers suggesting that Paul go out of his way to travel to the southern highlands for a chat with the grand old man of Australian art. Alas, for these two lovers of The Lake, they were destined never to meet. If Lake Eyre was a labour of love, Paul Lockyer will also be remembered for his coverage of sport ( he won a Logie Award after the Sydney Olympics ) and of hard news, both as a foreign correspondent in Asia and the US and his more recent work in the bush. 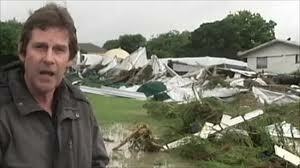 Last December, he came to national attention for being the first reporter into the Queensland town of Grantham, which was washed away by a torrent that killed more than two dozen people. 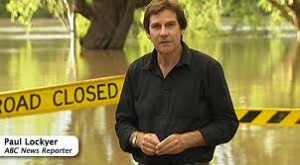 Paul spearheaded ABC Television’s coverage of the Queensland floods – again using the Corporation’s chopper – and did such a sterling job that many are speculating that more accolades await him posthumously in the next round of journalism awards. When people in their twenties die, they’re invariably described as “forever young” – the celebrated title of songs by both Bob Dylan and the German “synthpop” group, Alphaville. Paul Lockyer was 61 yet had the visage and frame of a man half his age. Many Australians accustomed to seeing him on television will have been startled to learn with his passing that he began his journalistic career in 1969. When we met up with him the other day, Grubsheet couldn’t help remarking yet again on his eternally youthful appearance, quipping that he needed to share with those of us less fortunate the name of whatever brand of elixir he was taking. There wasn’t one. Except for boundless optimism, a capacity for friendship and a love of story telling. The elixir of life. Graham – what a wonderful read. Just so, so sad. Our thoughts and prayers are flying over the Tasman Sea from NZ to Paul Lockyer’s family and friends. GD, A great read. I was thinking of doing something on my blog, but you captured Lockers so well, I don’t need to (except to say goodbye in print). He was a great mate and had a gift for friendship that was wonderful to behold. To go on the road with him was a delight. As you noted, they loved him in the bush, and it’s easy to understand why — he loved them. It was a Mutual Admiration Society of the highest order. You did Lockers proud, Graham. I dips me lid to you. Thanks for sharing these thoughts Graham. My contact with Lockers was much less than those of you who worked with him daily when at Nine, but I’ll always remember his friendly spirit, open manner and kind eyes which were evident in his contact with us and in his stories. My thoughts are with his family, both at home and in television. A beautiful tribute to a fine man. Lovely words Graham. As always, thank you for sharing them. W.
He was a prince amongst men Graham and an easy guy to be friends with. You managed to capture that in this lovely eulogy. He will be missed. GD, you have captured the humanity and humility of ‘Lockers’ – we have lost one of Australia’s best storytellers and a most-loved colleague. Thanks for those wonderful thoughts Graham, he was a great man….Lake Eyre is now a VERY special place. Excellent piece written by a man who genuinely cared for his friend Paul Lockyer. Beautifully said Graham. Paul was a genuinely lovely bloke. We’re all the poorer for losing a wonderful storyteller. I’ll miss his passion and his authenticity. Bravo GD…you’ve described our dear mate of 4-plus decades, Lockers, superbly. We were all so very fortunate that he was our friend. Oh how we’ll miss engaging grin, his uncommon wisdom and those unforgettable spoons recitals. Mackers. As Ian Mac, and you have pointed out, we were so fortunate to know Paul.